Spring Fair – Only 2 weeks to go! Thanks to those who have signed onto the Spring Fair roster already, if you are yet to join us, please jump online as soon as possible, we really need everyone’s help on the day. We’d still love lots more donations of clothing and second-hand treasures for our Big Sisters Wardrobe and White Elephant Stall. Please drop off to the Parent’s Room. Thank you for all putting their names down on the Parent teacher proforma this week. If you by chance missed putting your name on the list please email me at the new email (provided last week via Class carers email) over the weekend. The Parent Teacher Interviews will not be as elaborate as Mid-Year Reports. Their main purpose is to discuss the Transition Reports, so please bring the completed reports with you. I have scheduled 20-25 minutes to accommodate short and long interviews. Please be patient with any time overlap; we will try and stay to scheduled time as much as possible. The reason for the interviews happening in the first half of the term is threefold. To keep within Department guidelines of them being completed and handed to Prep in November; to enable me to spend time past the Fair meeting the new Kinder families (I will have similar Parent Teacher Interviews with the 2017 families); and to allow Heather to have the Transition Reports prior to meeting with you all. I look forward to meeting with you all next week. In the heart of the seed buried deep, so deep. “Wake” said the voice of the raindrops bright. What a wonderful place the world might be. Our class has been very small this last week as there is a lot of sickness in Prep. We send our best wishes to all those who are unwell and hope you are feeling better soon. The recent ‘Prep News’ email contained all our recent news. Ron and Sarah will be visiting us in Prep on Wednesday 2nd November. The weather is looking encouraging for our Working Bee in Prep next Monday 24th October 10.50am-1pm. We look forward to sharing some of our Prep day with you. We are enjoying the changing spring weather – with skipping and hopscotch, mud pies and gardening, sand tunnels and water flows, caterpillars and worms! 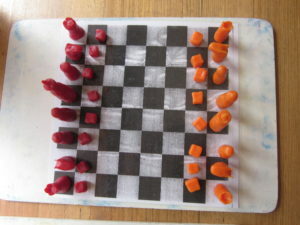 We have learned to create a story with beautiful Form Drawings as the lonely King searched over mountains and hills, forests and sea to find his Queen. We are also counting on with Portly Plus and Minnie Minus to help us. We have found that all together the fairies have gathered 110 lost teeth from our class of children! 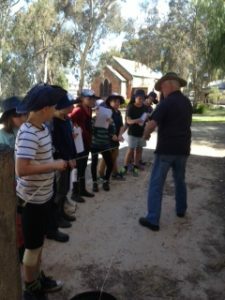 Life often takes some rather unexpected turns and for Class 6 this has meant that our long awaited Horse Riding, which was planned for last week, has had to be postponed until early November. With so much rain this year the Hume Weir was overflowing and water had to be released at a rate that caused a greater risk of flooding downstream, including Strathmerton, the venue for the camp. Of course it was very disappointing but we can now live with the excitement of anticipation for a few weeks longer. This has meant we are doing a Mathematics Main Lesson now and delving into many marvellous mysteries. 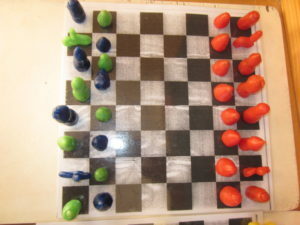 That you can make many numbers from combinations of 4 4’s? Some say you can make every number but we have proven at least numbers 1 to 10 are possible and many others. 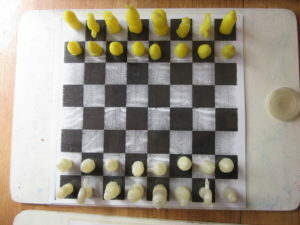 If you put 1 grain of wheat on the first square of a chess board, 2 on the second, 4 on the third, 8 on the fourth and keep doubling all the way to the 64th square you will need more wheat than the whole of the world produces in approximately 1,220 years. 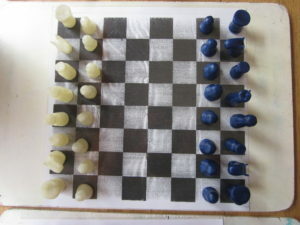 This chess puzzle led us to making exquisite wax chess sets that are of course now in regular use. Next week promises to very busy with something extra happening nearly every day. Friday – Perhaps we need to do something else??? 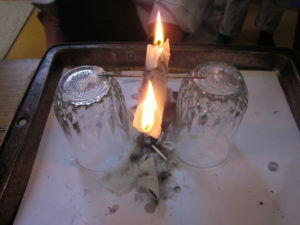 We are presently involved in a Science Main Lesson, focusing on Chemistry and in particular, combustion. 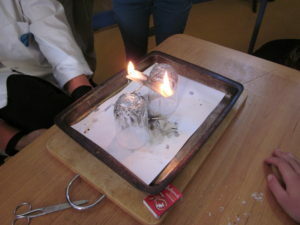 Needless to say we have had a lot of experiments involving fire! It is a very busy term so please check notes sent home and the Penny regularly. 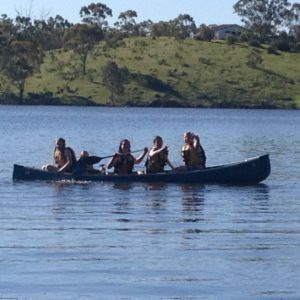 It was wonderful to hear all the news of the Class Eight rafting camp at Assembly this week. 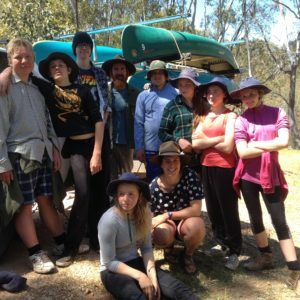 They built and sailed their own raft, camped under tarpaulins, got wet and sunburned in turns, found plover’s eggs, slept on the islands of Eppalock and generally had an idyllic time. 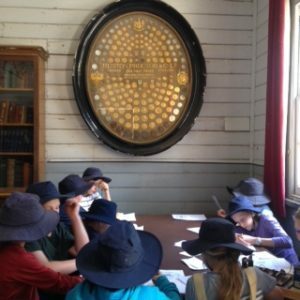 They have created some beautiful art work for the Thank You cards they designed for the Latrobe Outdoor Education students who helped to make it such a success. And of course huge thanks to Lisa for making the camp so memorable for them all! Our Knit A Square Project for Youth Homelessness has had tremendous support from parents, teachers and students! We are delighted to announce that we now have forty three squares and are still counting! It looks as though we will be able to raffle a rug at the Spring Fair as planned … and still have enough squares for a second rug to donate. Aren’t you all fantastic!! It is not too late to knit a square! There are still needles and wool at the office – or create your own square from any oddments of wool you may have. The great joy of a knitted blanket is that every colour of the rainbow looks good in it! Just have your squares back to school by the time the Cup weekend starts (Friday October 28) as I think we will need this weekend for The Great Sewing- It -Together Finale! Could you please remind your child to bring to school any Craft Project they have made this year? Thank you. Class 7 and 8 Eurythmy Performance, Thursday November 24th, 7:30 pm. Week Three of term and both Classes Seven and Eight have returned from their camping adventures with healthy appetites! In two successful cooking sessions we baked delicious French madeleines with orange zest and butter … and managed to consume them in record time, despite having made FOUR trays of TWENTY madeleines per tray. 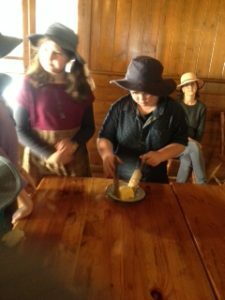 We did say that they were best eaten while still warm – and all students took this challenge very seriously. Apologies to hungry teachers and office staff who hoped for a few leftover crumbs! Class One revisited some of our French songs this week when we managed to fit in a singing session and they not only sang beautifully (and reminded me when I forgot the words!) but can count to twenty in French as well! We hope that our next session might involve a new spring or summer song, along with matching weather if we are lucky. And Class Six are expanding their classroom routine this term to practise a little French conversation in small groups, along with their usual lovely book work. 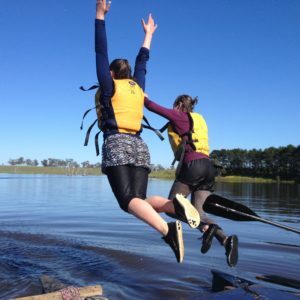 Last week I had the privilege of accompanying Class Eight, having a fabulous time rafting around Lake Eppalock, sleeping on islands, sleeping under a tarp, cooking around the campfire and some even braved swimming in the cold water! A group of third year Outdoor and Environmental Education students organised the trip and did a splendid job. 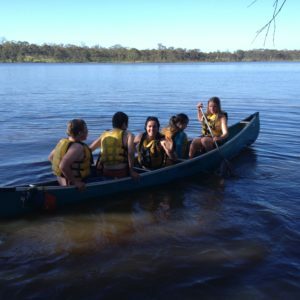 We are fortunate to have our well established bush food island for our students to work on. We also have bush food plants planted around the yard, which, on occasion we can dig up and eat. Over the last ten weeks I have had the privilege of attending Auntie Julie McHale’s bush food course. We have learnt about lots of indigenous ingredients, how to cook them and how to grow them. This experience has enriched my teaching of the gardening curriculum at our school. Here’s a photo of tubers from the course, ready to cook (orchids and lilies) indigenous to our local landscape. Last week on Monday our Class Seven and Eight Physical Education lesson was delayed whilst we watched and listened to the wonderful students from the Mansfield Steiner School Orchestra. What a pleasure it was to experience this mesmerizing performance from these talented young people, ranging from Classes Four to Eight. The variety of instrument sounds combined together perfectly, but I was more impressed by the visuals of the show. The bow control, precision and synchronicity between all involved was truly spectacular. After the show we all headed out to the soccer field to have a big game of soccer with the Mansfield students. The game was played in great spirits with some wonderful individual and team efforts. 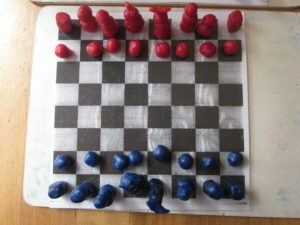 It was a very inclusive game for all, and great sportsmanship and consideration was shown, given the varying ages of players. 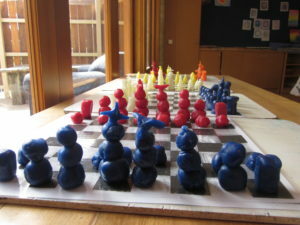 Class Five came out to also join late in the session, meaning we had about 50 people playing, teachers also. At some points the game reminded me of playing pinball as a young boy! On Tuesday Class Five played a variety of imaginative games whilst practicing some wrestling moves ahead of the upcoming Greek Olympics. The duck game introduced to the children seemed to be very popular. 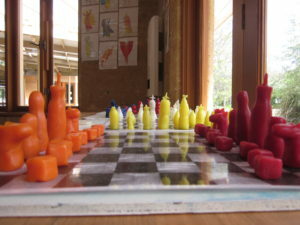 It is a fast-paced game that required the children to meet other ducks and play paper, rock, scissors or an alternative was to count the number of fingers and thumbs that both ducks held up. The successful duck would advance and be able to stand and walk and challenge another walker. Victorious walkers then stood on chairs where they would again challenge oncoming walkers. After one minute the final four on chairs played off to establish our champion duck. We had one young girl who proved to be quite the paper, rock, scissors champion! Class Six students continue to impress me each week with their rapid improvements in many different areas of Physical Education. With their bodies changing in size and shape, and with confidence building in their own ability, they are reaching new highs in each lesson. We have played basketball over the last two weeks and not only are the individual improvements and efforts impressive, but their ability to work as a team, a fundamental part of basketball, is proving to be very rewarding. They are a very tight group of children with strong bonds. Keep encouraging your children to do something physical. I myself am trying to get back into some running and weights training. This warmer weather sure helps achieve that! Congratulations to Raziel and his wife Nicole on the safe arrival of their first child, a beautiful baby girl. There were a few glorious hours of sunshine today – enough to dry our beautiful rainbow felt. Thank you to Elizabeth from Morning Star Crafts for providing the food dyes and teaching us the technique. Some of the squares will be available for sale from the Craft Stall at Spring Fair along with the beautiful felt and silks in seasonal colours Aleesha and Natalie have been dyeing over the last few months. 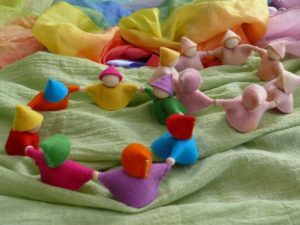 During our Parents & Friends get together this Wednesday, we’ll be creating celebration rings with some of the rainbow felt and hand dipping birthday candles. We will also be taste testing our scone recipe for the cafe at Spring Fair, so if you have a hankering for craft, tea and scones – come along any time between drop off and lunch time. There are plenty of small jobs that need doing before Spring Fair. Talk to your Class Carer or one of the stall coordinators if you’ve got some time available to sort, price, weed, clean, bundle, etc. Lastly, our organic and fairtrade fundraising chocolate is still available for $4 a bar or $20 for 6 bars. Chocolate is available for purchase (by adults) from Reception or contact me on 0424 318 255 for more information or to organise a delivery. School photo packs were distributed recently. Family discount envelopes are available at the office. There is an option to pay online, however we still require your pack to be returned to the office with your online reference number. Please return all completed photo packs to the office by tomorrow, Friday 21st October. Spare forms are available at the office. School photos will be taken on Tuesday 25th October. If you want your child to have a dental check please return the forms tomorrow, Friday 21st October. Spare forms are available at the office. Does anyone have a tractor and slasher, and is interested in giving the school an estimate to cut the grass/cape weed in the carpark paddock? Please let the office know ASAP. Thanks. Very small, glass jar with cork lid and tiny little biscuits/faces?? Found in the car park. Come to the office if yours. For your convenience the School now accepts payments for school fees by direct debit from your bank account or credit card in weekly, fortnightly or monthly instalments spread across the term. To set up your direct debit, please complete and return the direct debit request form sent to you with your statement. Payments will then take place automatically according to the payment schedule you request, and a reminder will be sent to you by SMS if you select this option on the form. School hats must be worn between 1st September and 1st May each year for every play time and on camps and excursions. This complies with State Government Sun Smart program requirements, as a preventative strategy to skin cancer. Hats are available at the office. The cost of $12.50 will be charged to your account at the end of the term. As per school policy we cannot sell the chocolate to children. If you would like your child to purchase chocolate please call or email the office and we can sell it to them at the end of the day. The Department of Health and Human Services has identified a new strain of norovirus which may lead to gastroenteritis outbreaks. More information can be found here. Parents please be aware that we have recently been informed about bee swarm sightings. Please take care throughout the school at this time of year when flowers are blooming and advise the office of any sightings, particularly those heading towards the school and students. A theatrical four-course dinner for $65, includes glass of wine. told by Castlemaine’s favourite story tellers.